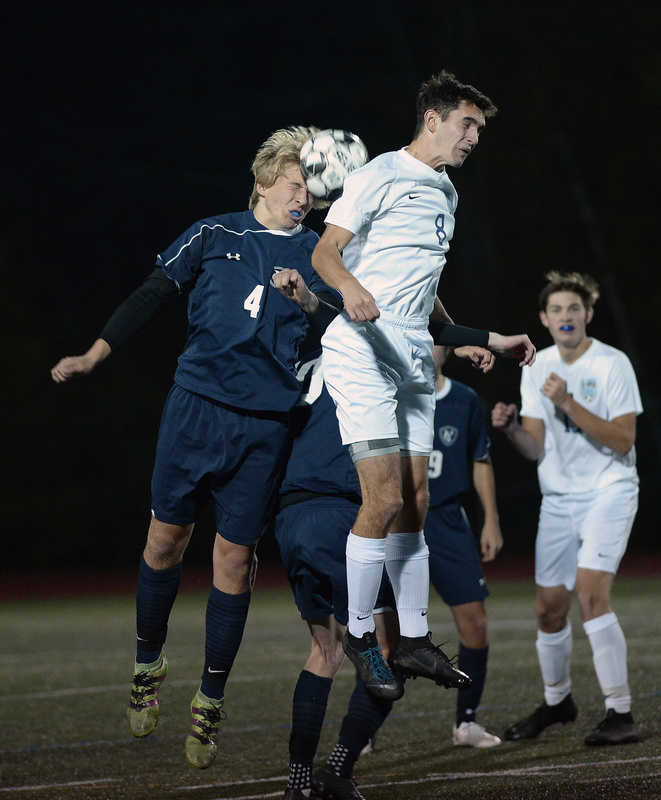 YARMOUTH — The Yarmouth boys’ soccer team entered the playoffs wearing an industrial-sized bulls-eye, but instead of feeling the pressure, the Clippers’ attitude is simple. 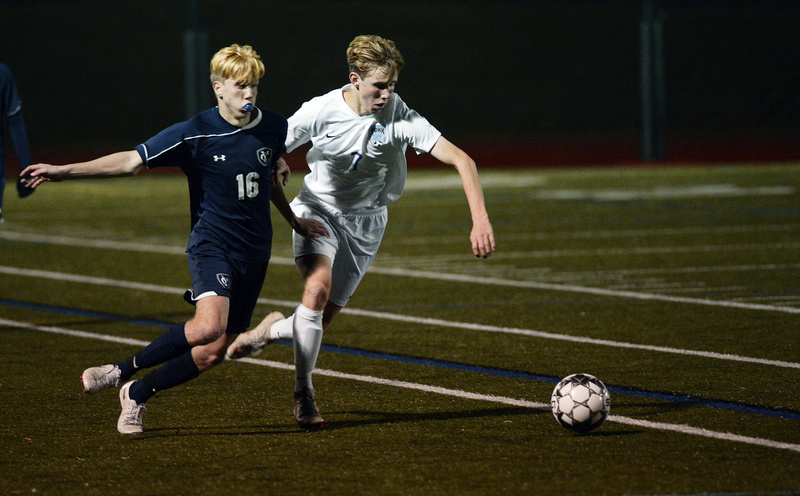 The four-time defending Class B state champions have a potential minefield of a draw, but the top-seeded Clippers began what they hope is another title run Tuesday with a decisive 4-0 victory over eighth-seeded York in a Class B South quarterfinal. 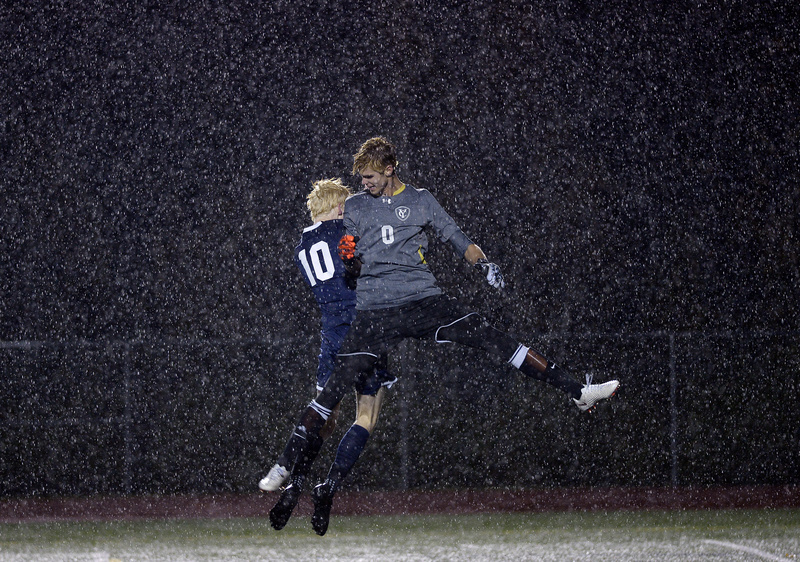 Yarmouth’s Jack Jones, left, and Aaron Belesca celebrate at the end of the game as the rain comes down. Yarmouth scored two goals in each half, getting goals from four players, and improved to 13-0-2, advancing to host No. 4 Cape Elizabeth (8-4-3) in the semifinals Saturday. 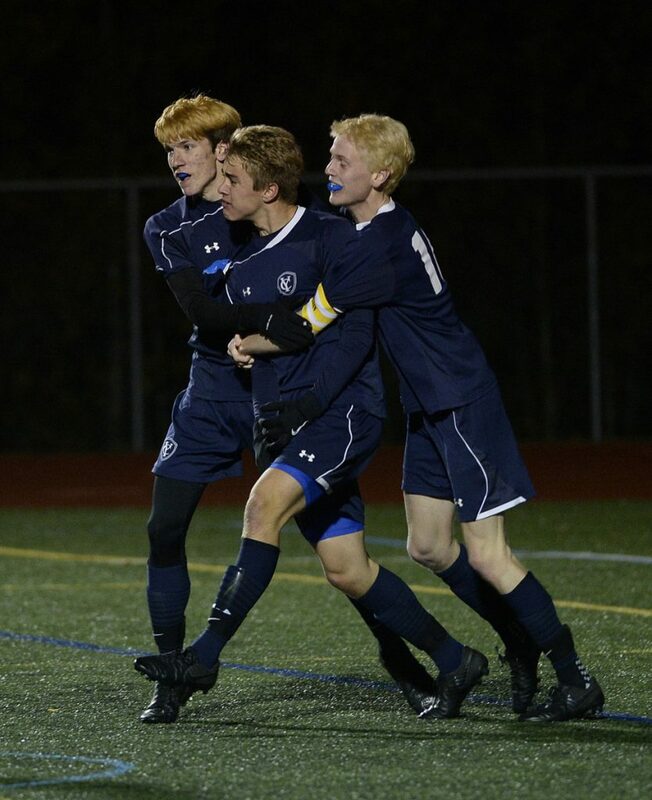 Aidan Hickey started the scoring with 9:44 remaining in the first half, off Yarmouth’s eighth corner kick. After Eric LaBrie and Jack Jones failed to steer home a loose ball in front, Hickey finished to break the ice. Yarmouth’s Jason Lainey battles for the ball with Nick Rainforth of York. The second goal came with 3:36 left, as Jack Romano, who had been denied moments before, fed Liam Ireland for a shot that he ripped past York goalkeeper Gray Messersmith (10 saves) just inside the left post. With the rain picking up in the second half, the Clippers got their third goal with 19:03 to play, with Ireland setting up LaBrie for a low blast that eluded Messersmith. With 15:54 left, Ian LaBrie set up Cam Merrill for a 4-0 lead and Yarmouth closed it out from there. Julie Johnson, York’s first-year coach, was happy with the effort from her team, which finished (7-8-1). Yarmouth’s Ian LaBrie battles for the ball with York’s John Rodrigues. “Yarmouth’s a really talented team and we knew coming in that it would be a battle, but I’m proud of how my kids hung with it,” Johnson said. The Clippers had a 14-2 advantage in shots on frame and an 11-1 edge in corner kicks. They got a combined two saves from goalies Aaron Belesca, Spencer King and Isaac Owen. Yarmouth had two one-goal victories against Cape Elizabeth this fall, and the Clippers expect getting a third on Saturday won’t be easy. “The kids put themselves under pressure because they expect to win, but we’ve never emphasized that,” Hagerty said. “We just play better against our toughest opponents.